Think small town. Average income half the state median. Still proud of the glory days that put towns like Bolivar in the southern tier of western New York State on the map — in this case, the oil boom of 1885. Evidence of those prosperous days is in the fine homes in the village. Now, the up-to-date school, the farms, and the handful of businesses matter only to the 1154 people who live here. County Route 40 leads to Messer Hill Road. At the very top, elevation 2217 feet, you’ll find a place where the oil turned into a diamond. 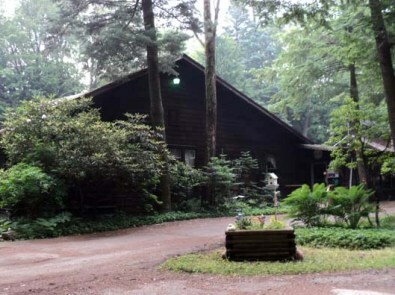 Presently a diamond in the rough, Hilltop Lodge Glamping Resort was the retreat of industrialist William A. Dusenbury, who dealt not just in oil and gas, but lumber. He was also president of the bank his family helped organize. Hilltop is where the locals go on Friday nights for a fish fry or pasta. Over time you might be less distracted by your surroundings and actually notice what’s in the salad. So far, I can’t stop looking at the redwood paneling, even when I’m not in the room with the vaulted ceiling and great fieldstone fireplace. Mr. Dusenbury’s compound dates to 1928 when he had his own redwood logs trucked in from California and milled on site. Besides the lodge, a clam house, and garage and quarters for the caretaker, a four-bedroom “cabin” was home away from home. Another fireplace, showers with seven heads, porches and generous windows took the rust out of rustic. The buildings sigh for want of a caretaker. Hans, I’m told, stayed on at Hilltop until 1960 as arranged by his employer, who died in 1942. The real charm of the lodge, though I’m a sucker for Craftsman style, owes much to the setting. Dusenbury’s landscapers came from Germany to create a black forest hideaway on top of the hill. They likely envisioned the present day covering of hemlock and hardwoods and the intermediate canopy of rhododendron — evergreen and appealing whether in bloom or not, their slender trunks gnarly and interwoven. Underneath it all, bright pachysandra, dark myrtle, and big-as-a-pie-plate May apple fronds form a patchwork of shades of green. Lush ferns grow down low and waist high. The grounds, left largely to their own devices, are not untamed. Rock gardens, stone steps, and a curvy fishpond now being restored, tug you into the past. You can almost see ladies in long, narrow skirts and men holding glasses of beer at a summer clambake. Hilltop Lodge is billed as a glamping (glamorous + camping) resort. Several cabins with modest motel furnishings are only a few paces from the restaurant. It’s not a bad setup for those who like to have cake and eat it without doing the work. Enjoy the woods, the seclusion — even a campfire if you like — but sleep in a bed, have a private shower and in the morning get yourself over to the lodge for coffee and a real breakfast. You’ll feel like you’re at your mom’s. Show up for lunch and dinner, too. It’s part of the package. Mr. Dusenbury was a man of means and good taste, known for investing both his time and money in charitable works. His lodge still serves as a retreat in every sense of the word.